The Ebro River is the most important river in Spain, 928 km in length and with a drainage basin of 85,550 km². It also generates the Ebro Delta, one of the largest wetland areas (320 km²) in the western Mediterranean region. 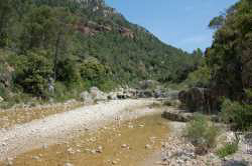 The Ebro is largely regulated by dams and channels, which have altered its hydrological and sedimentary regime. During the 20th Century the mean annual flow decreased by approximately 30% due mainly to reforestation at the headwaters and rainfall decrease. In turn, sediment load has decreased by 95% due to reduced soil erosion and sediment trapping in reservoirs, affecting distal ecosystems, such as the delta. The entire basin hosts more than 2.7 million inhabitants and only 5 cities located next to the Ebro River or its tributaries concentrate approximately 45% of the region population. The total water demand for domestic uses is 506 hm3 yr-1 and that for industry is 250 hm3 yr-1. Agriculture, cattle breeding and aquaculture consume 7310 hm3 yr-1. The non-irrigated agriculture in the Ebro basin uses 37% of the land in the basin, whereas irrigated agriculture represents 15%. Forests cover 24% and shrublands and grasslands cover 23%. Urban and industrial areas together with water bodies cover about 2%. Abstraction of ground and surface water, together with the agricultural and industrial activities mentioned and the impact of the waste water treatment plants have deteriorated soil and water quality. Salinization caused by agriculture run-offs constitutes a major factor of water quality spoiling in the medium river course. Pollution due to persistent organic pollutants, pesticides, brominated flame retardants and more recently, pharmaceuticals and illicit drugs have been studied in the entire basin and its concentration appeared to be relevant in some sites of the basin. The Ebro catchment encompasses a biogeographic zone where southern and northern species occur, making assemblages vulnerable to introduced and invasive species (e.g. Dreissena polymorpha, Silurus glanis). There is considerable background knowledge and information coming from other research projects and Water Authorities, so that extensive field campaigns will mostly focus on just some, currently undefined, characteristic perturbations. Thus, the focus will be on performing medium-scale controlled field experiments to answer specific questions. to assess change scenarios in the freshwater ecosystem services and the effects in socio-economic development in those sub-basins previously mentioned.